This Saturday I spent the day in China. Shenzhen, a city bigger than Hong Kong, is just across the border, only an hour from Central. It's easy to forget how close we live to a Mainland metropolis, and I was eager to see what it's like before my current China visa expires. ...so we spent much of our visit inside the big shopping center at Lo Wu, just a few steps away from the border. 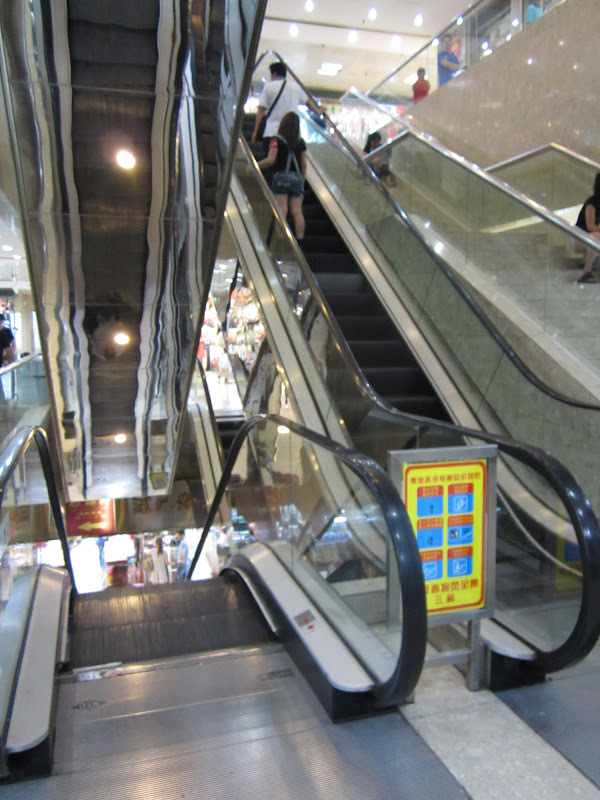 Every level has hundreds of retailers. Many sell knock-off designer shoes, bags, and watches, but there is so much more than that available. 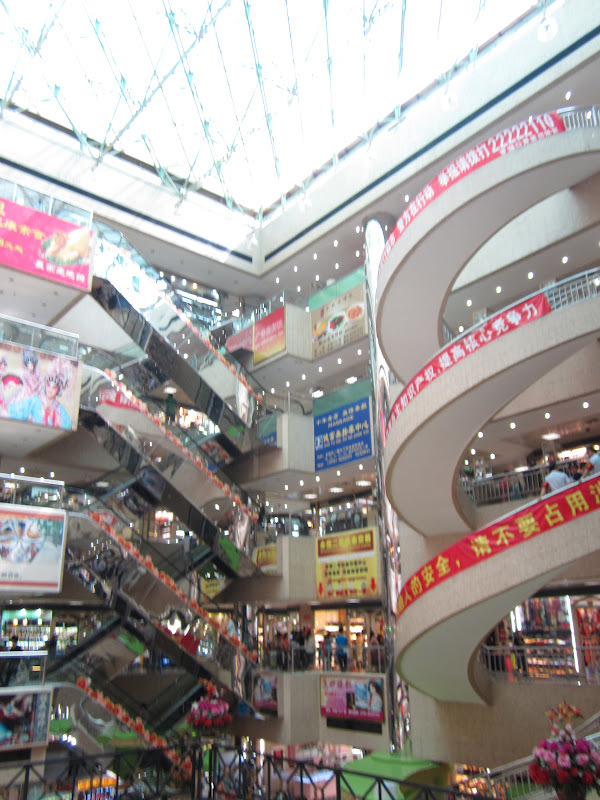 Local Chinese designers sell original items, and there are boutique-like shops as well as the factory outlets. This atrium might give you some idea of the size of this place. Even the atrium has a shopping center inside it. ...past hundreds of shops, shoppers, and touts calling for our business. We emerged to find it had become a hot, sunny day. 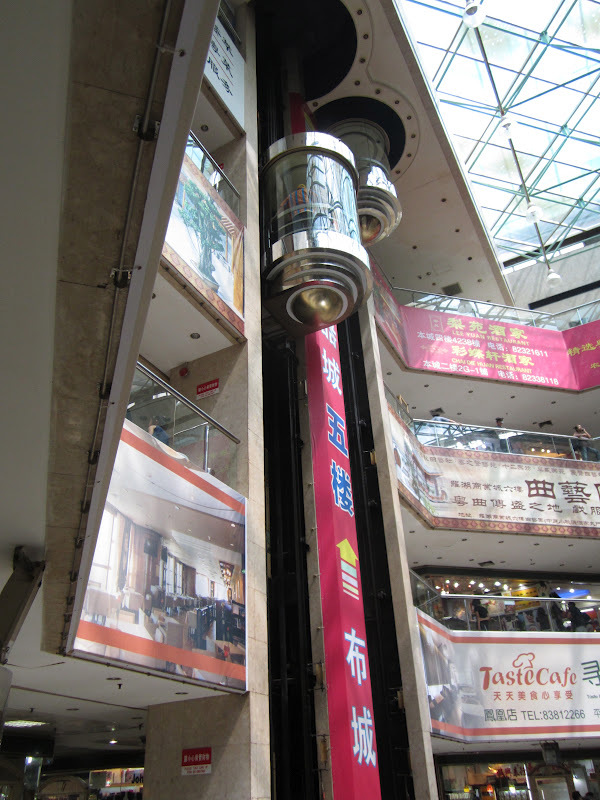 This is the Lo Wu Shopping Center from the outside. I only took pictures here, but we went off into the center of the city for a massage. We went to a respectable, clean spa where the 90 minute massage (plus full use of the sauna, steam room, and awesome showers) cost around 20 USD. Afterwards, we wandered around the city streets. Shenzhen seems low-key compared to Hong Kong. The streets were wider and we saw many families hanging around and enjoying the sunshine. In that location at least, it was less frantic than Hong Kong. I saw familiar wet markets, trendy shops, and busy restaurants, but without the English signs that are standard in HK. The prevalent aroma was that of stinky tofu. I also spotted a woman getting acupuncture right on the sidewalk! I've never seen that in HK. This was my first visit to Shenzhen. I know several of my readers have spent quite a bit of time there. What do you think of it? What are some other differences that you notice between SZ and HK? These are great photos! It's so fascinating to see Shenzhen--through your photos--14 years after I last set foot there. The train station building and bus depot are more or less the same. That greenery off to the side of the station building is new. The big mall at the station is new, too. Back when I used to go to Shenzhen, there was a Seibu not far from the station, but that was the only luxury shopping in that area. Is the walk over that bridge still outdoors? That bridge always felt kind of surreal. Shenzhen is dirtier than HK; much more litter on the streets including chicken bones etc.Cigarette smoking is more prevalent (and so is spitting). We stay in Futian when we go, which is quite a fancy high class area, lots of shops and restaurants. In November, the traffic lights at a busy intersection (3 lanes each direction) went out whilst we were there. I've just come back...and they are still broken!Out in Dafen, about 45mins on their very new and very clean MTR, I saw a rat in a trap outside an artists store. Small boys (and not so small boys!) can regularly be seen peeing in the street. But hey, I might end up moving there, so I have to learn to love it! Your site http://akindleinhongkong.blogspot.com/ has been brought to our attention because of its interesting travel related content. We are contacting you with a unique offer to monetize it as a HotelTravel.com affiliate partner. HotelTravel.com is keen to establish a working relationship with sites like yours to help expand our reach and entice your visitors with addition information about hotels and travel related tips. In the process it will help increase traffic to both our website and give you the chance to earn extra cash. with generous commissions (4% to 8% with no processing fees) and cost per click benefits, go to http://www.hoteltravel.com/partner/index.aspx for more details. If that sounds interesting then HotelTravel.com would be keen to hear back from you as soon as possible. You can also email us at affiliates@hoteltravel.com or contact me directly.